Will Beyonce be jealous of your healthy scalp? Probably not. But here's why you should use tea tree oil anyway. Imagine a world with no dandruff and no itchy, dry scalp. A life in which you don’t have to strategically bobby pin your bangs over that area where your hair just stopped growing. Even if you don’t suffer from hair loss or dandruff, using tea tree oil for hair health is a no-brainer. Tea tree oil will help promote healthy hair growth, rid your scalp of any bacteria, and prevent the buildup of dead skin or product residue. Hair is easily damaged by environmental elements, like exposure to sun, dust, smoke, and wind, as well as the heap of products that we lather in and spray on. Add in a slew of chemicals if you color your hair or apply straightening treatments, plus everyday styling products and heat damage, and your hair is most likely stressed out! All shampoos and conditioners claim to give you the tresses of your dreams, but these products are filled with polymers, fragrances, and dyes, which means they cause more harm than good. So, what should you do? You don’t need to toss your favorite shampoo. But to promote healthy hair growth and prevent thinning, breakage, and further damage, simply add one of these tea tree oil for hair uses to your regimen. 1. 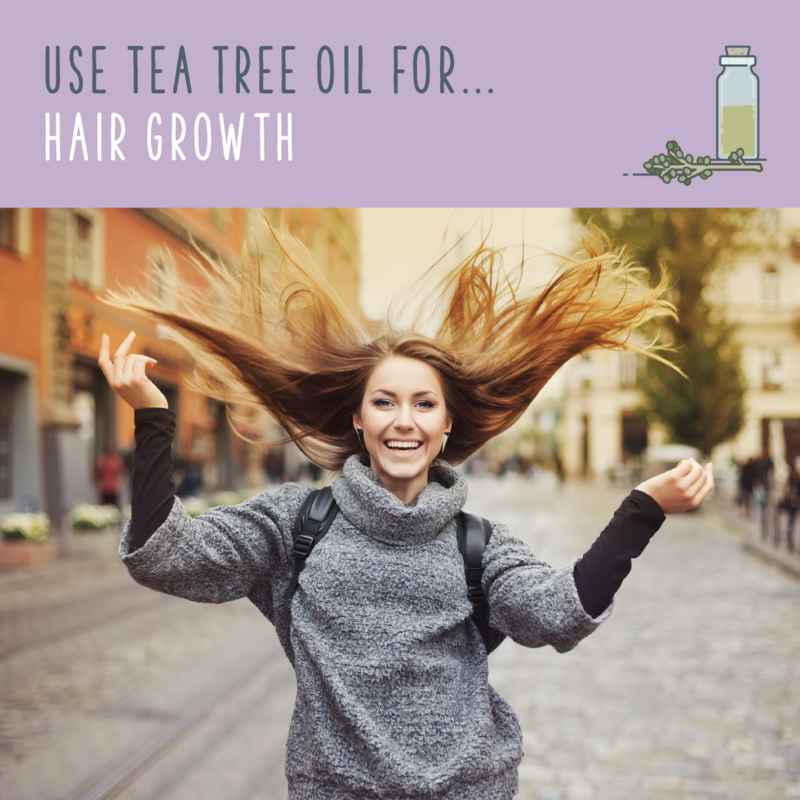 Tea Tree Oil For Hair Growth: Clogged follicles can inhibit hair growth — but tea tree oil helps unclog hair follicles. Take a few drops of tea tree oil, mix it with your preferred carrier oil, and massage it onto your scalp. 2. 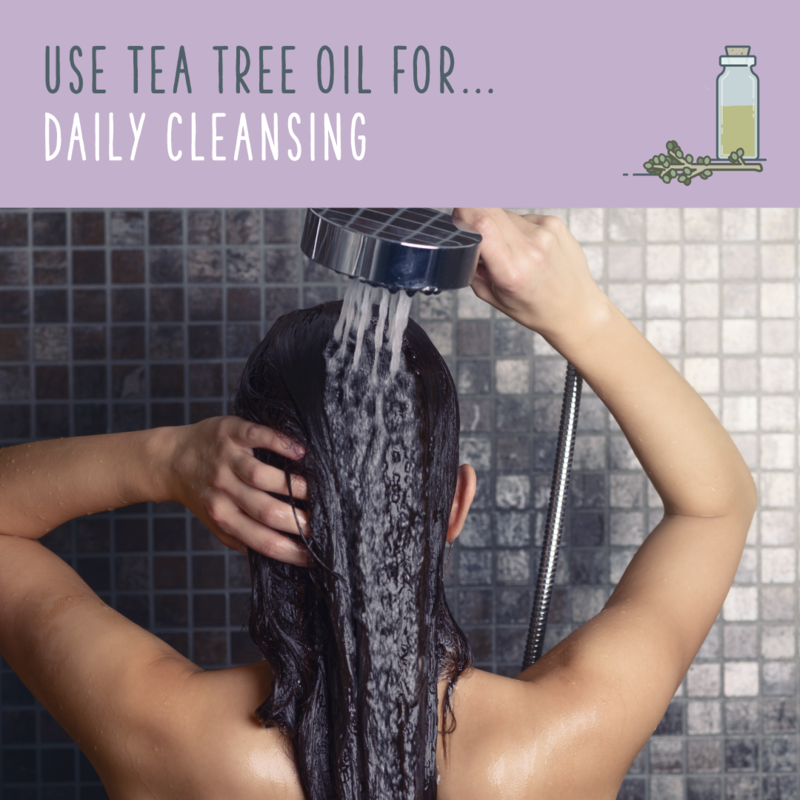 Tea Tree Oil For Daily Cleansing: Simply adding a drop or two of tea tree oil can help enhance the effects of your shampoo while adding extra moisture and nourishment. 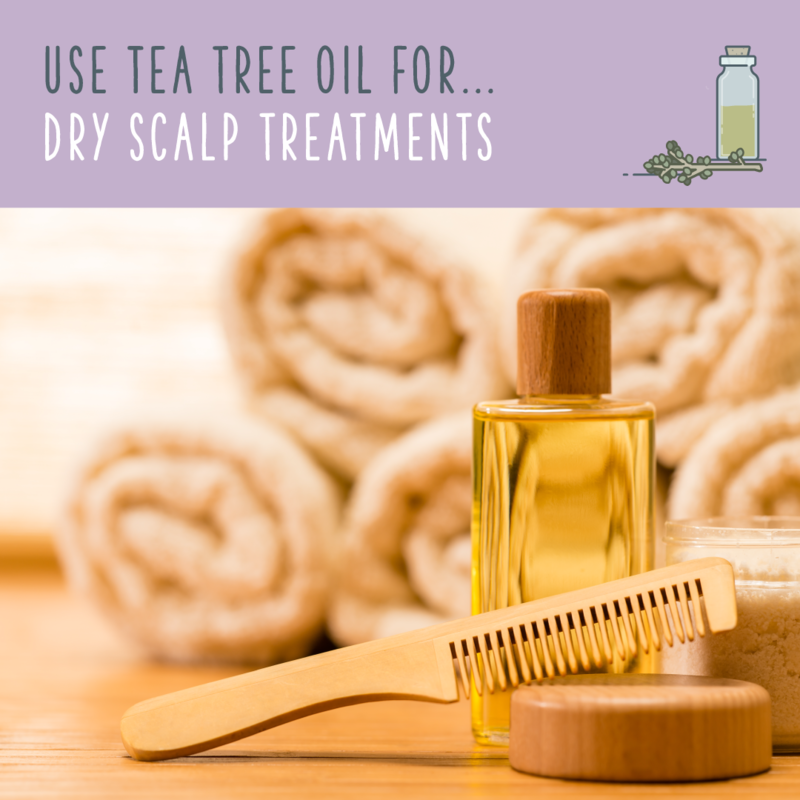 Massage your shampoo into your scalp for a few minutes to ensure the tea tree oil is reaching the hair follicle. 3. 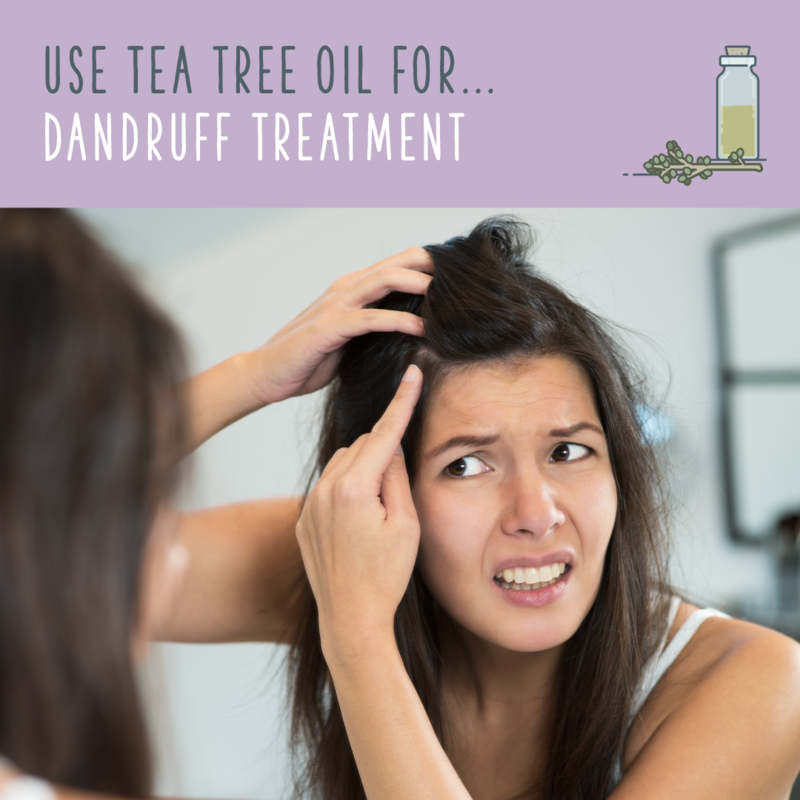 Tea Tree Oil For Dandruff Treatment: The antifungal and antibacterial properties in tea tree oil help fight off the fungus that causes dandruff, remove dead skin build up, and clear blocked pores. For dandruff treatment, add 10 drops for every eight ounces of shampoo, and massage into your scalp thoroughly. Keep the shampoo on for three to five minutes, and then thoroughly rinse. 4. 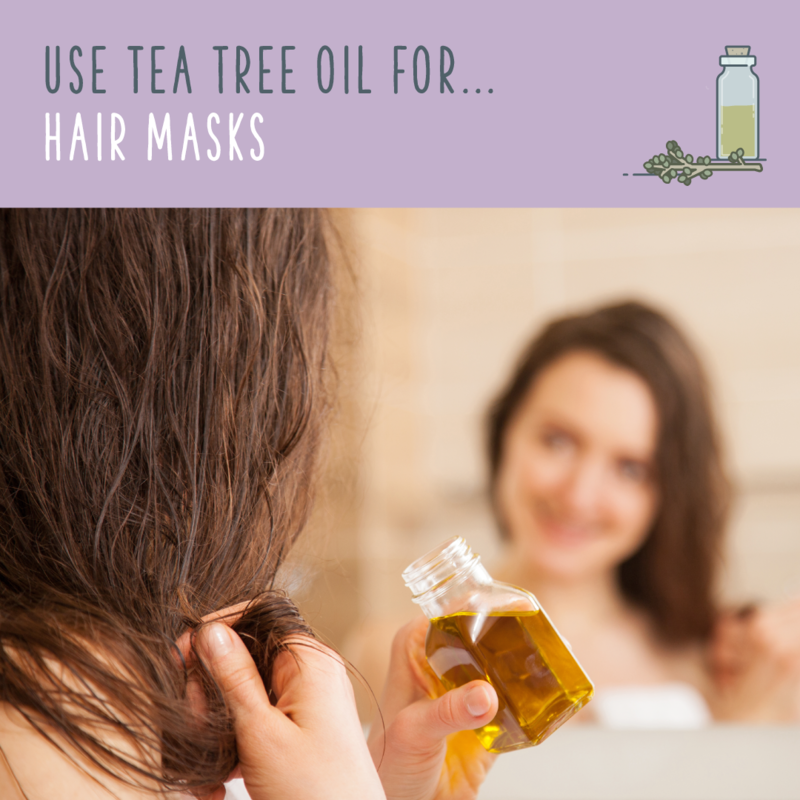 Tea Tree Oil Hair Mask: Choose a base, such as plain yogurt or mashed avocado. Add 10 drops of a carrier oil and two tablespoons of honey, and then mix well. Put on gloves to apply the mixture to your scalp, and gently massage it in. Leave the mask on for 10 minutes. Rinse thoroughly! 5. Tea Tree Oil For Dry Scalp Treatment: The antifungal and antibacterial properties in tea tree oil help rid your scalp of harmful microorganisms. It can also control excess oil without further drying your scalp, and its nourishing, moisturizing qualities can relieve your itching. To use, mix a few drops of tea tree oil with your preferred carrier oil (we love coconut oil for its added benefits! ), and then gently massage the mixture onto your scalp for 10 to 15 minutes. After rinsing completely, you can wash your hair as normal. Another option is to add a few drops of tea tree oil to your conditioner for added moisture! 6. 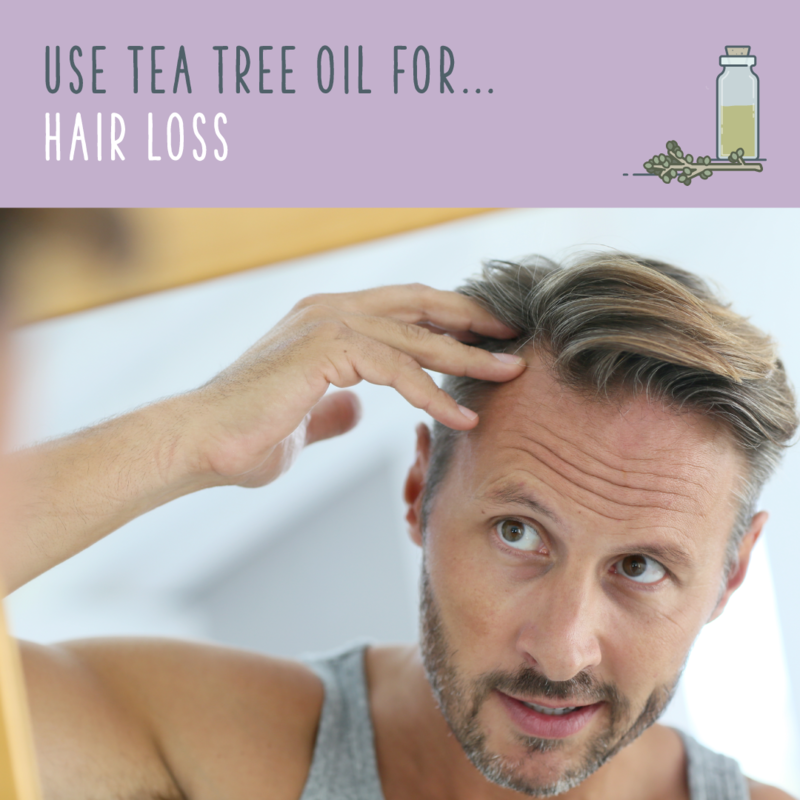 Tea Tree Oil For Hair Loss: Excess oil and pore blockage can cause hair growth to slow or stop altogether. But since tea tree oil can clear your pores and nourish your roots and hair follicles, it helps produce strong, healthy hair. 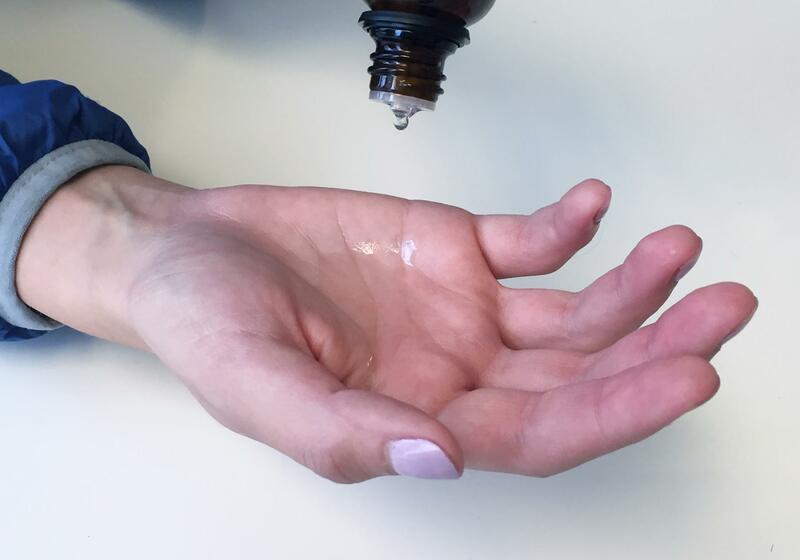 To use, simply take a few drops of tea tree oil in your palm and massage thoroughly onto your scalp or problem areas. This helps increase blood flow, allowing the tea tree oil to reach your scalp to work its magic! Remember: tea tree oil is concentrated and should be tested on a small area of your skin before you apply it to your hair and scalp. If any redness or irritation occurs, wash it off immediately, and do not attempt any of these uses for tea tree oil. If you have been diagnosed with seborrheic dermatitis, or any other skin irritation, please consult with your doctor before using tea tree oil for hair. Why Use Tea Tree Oil For Hair Care? Tea tree oil is extracted from the Melaleuca Alternifolia tree, which is native to Australia. Aborigines have been using tea tree oil for its natural antiseptic properties for centuries, but it didn’t go mainstream until Australian chemist Arthur Penfold discovered the plant in the 1920s. Tea tree oil has a slew of benefits for your entire body. In fact, it is quickly becoming a mainstay in medicine cabinets throughout the Western world. Make sure you purchase 100% pure tea tree oil by checking that the species name (Melaleuca alternifolia) is correct on the bottle. You should also see “Oil of Melaleuca—terpinen-4-ol type,” which means that the composition meets the international standard for the 14 active components of the oil. Light, heat, moisture, and exposure to air all can affect essential oils, so be sure to store your tea tree oil in a cool, dark, and dry place. Keep tea tree oil away from your eyes, inner nose, and other sensitive areas. Tea tree oil has a strong odor and gives off a mentholated cooling, tingling sensation when applied. If you feel a burning sensation, you have applied too much. Since tea tree oil is so concentrated, many of its uses call for creating a mixture of tea tree oil plus a carrier oil. This is common procedure when using any essential oil, including rosemary, peppermint, and chamomile. Carrier oils help deliver the essential oil to the hair and scalp and also compound the essential oil’s ability to moisturize, strengthen, and nourish your hair or skin. Carrier oils include extra virgin olive oil, raw coconut oil, jojoba oil, vitamin E oil, and avocado oil. If you have sensitive skin, use one part tea tree oil and 10 parts carrier oil to avoid irritation. How do you use tea tree oil for hair care? Share with us below! "With the time and money you’ll save by using tea tree oil, you’ll be able to splurge on everything you need to make your hair Bey-worthy."